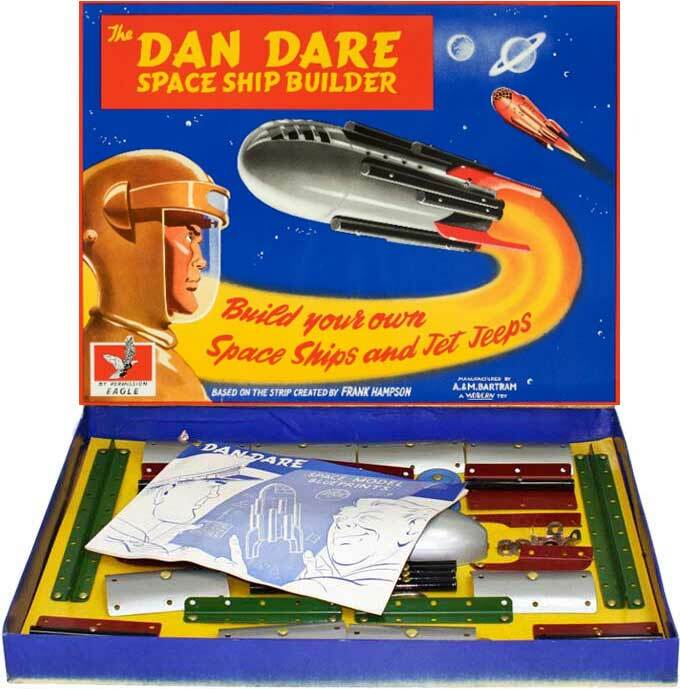 Listed below are the parts that make up the Dan Dare system. 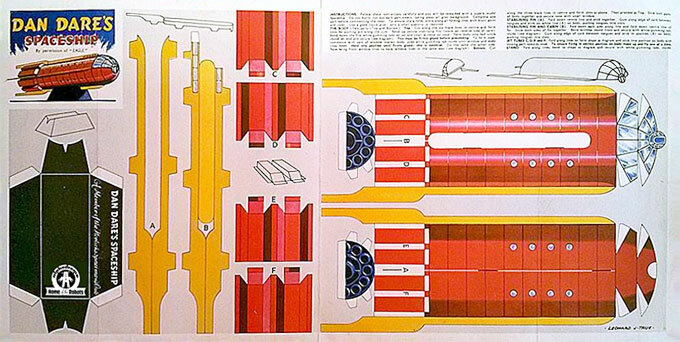 Images of each part are shown in the diagram at right. Hi folks, Doc here. 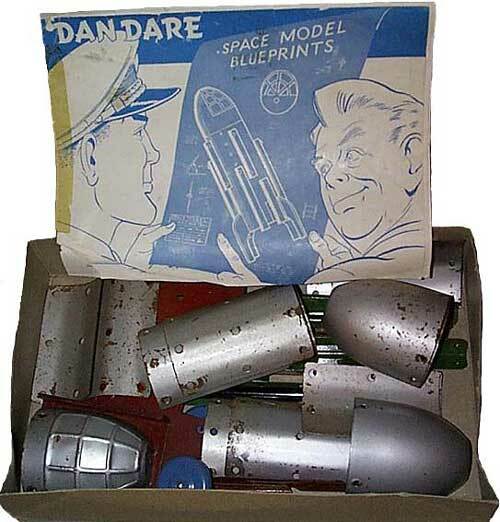 In England in the Spring of 1950, a vicar named Marcus Morris launched a new comic magazine called Eagle. Reverend Morris intended his magazine to be a wholesome alternative to the well drawn but often violent comic books that were being imported from the U.S. at the time. He recruited a young local artist by the name of Frank Hampson as his chief artist and illustrator. 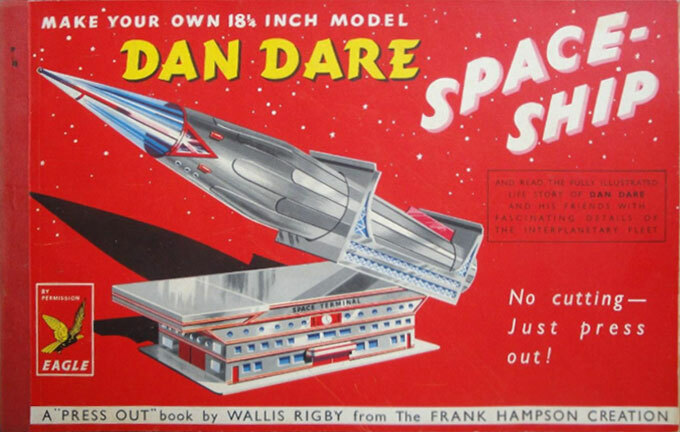 Hampson developed a new strip called Dan Dare, Pilot of the Future that became the Eagle's main feature. 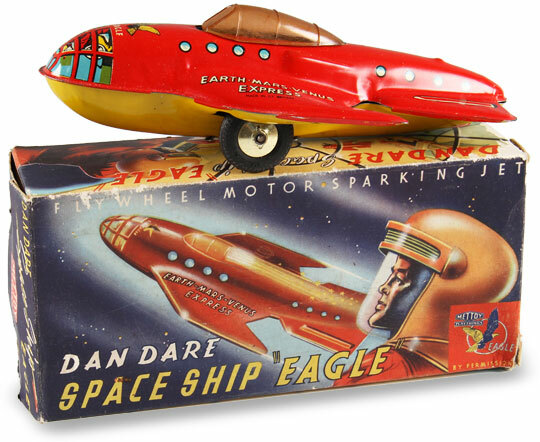 The Eagle was an instant success, and Dan Dare quickly became England's most popular comic hero. With this popularity came the obligatory product merchandising, with the character's name and likeness eventually appearing on a multitude of products including, of course, toys. 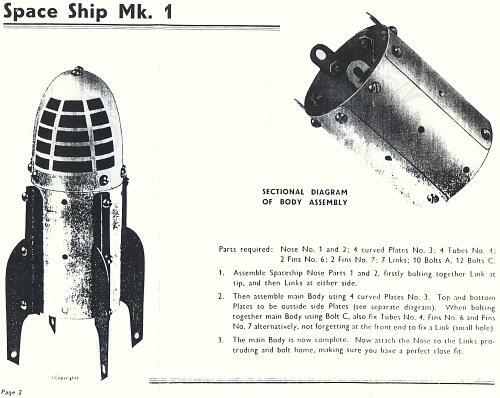 One of these was the small, simple metal construction set shown in this feature. 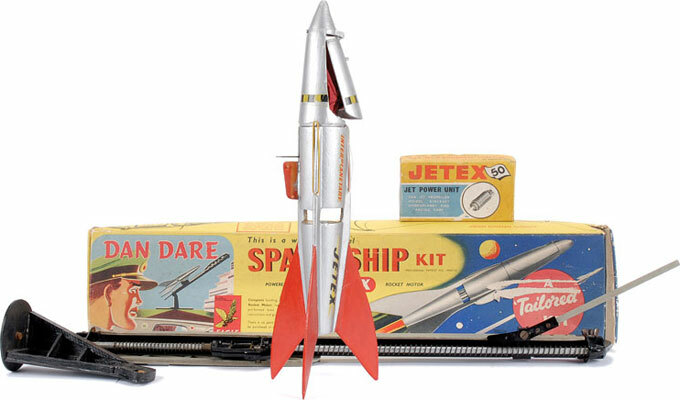 Unlike most of the construction sets I have profiled on this website, this particular set is a one-off toy with a specific theme. 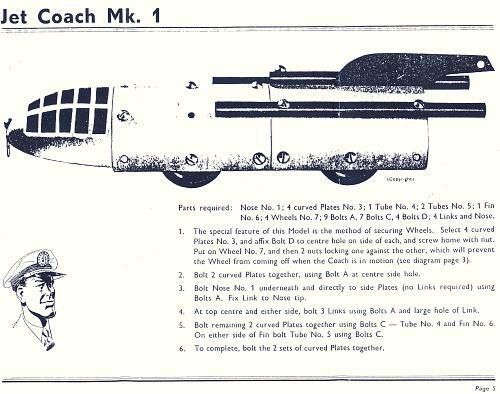 Still, it is a nice example of what can be done with a few simple parts that are cleverly designed. And, as you will see, it borrows from some of the general construction set concepts that we are all familiar with. For example, it features all metal parts and screw and nut construction. 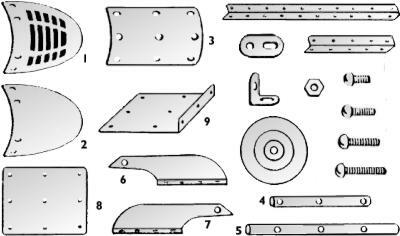 In addition, many of the parts are standard types, including fishplates, angles, angle girders, flat plates, flanged plates, etc. The set was produced by the A. & M. Bartram Company in Birmingham, England between 1953 and 1955. 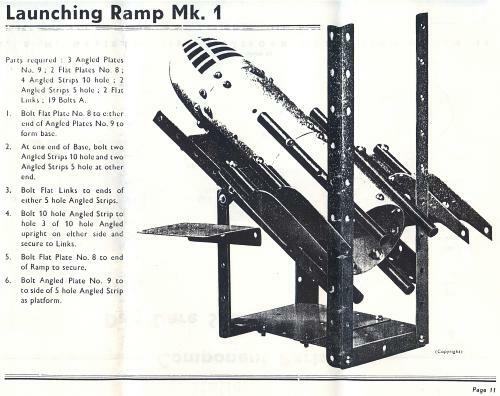 It included a two-color manual that contained instructions for building ten different space ship-themed models. 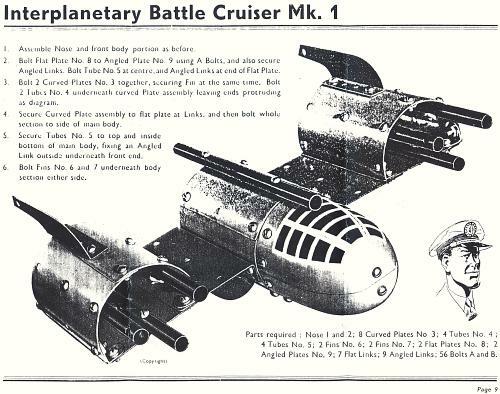 The parts are shown in the diagram and table below, along with set photos, model photos, and scans of selected models from the manual. It's interesting to note in the photos of the set that the flat and angled plates are red and the angled strips are green, just like similar Meccano parts of the same period.